Say Yes is a premium, fully responsive WordPress theme with modern and beautifully crafted design that’s ideal for wedding & family blog websites. Say Yes wedding theme is build on the Bootstrap 3 framework with smooth and elegant parallax implementation and full RTL support. Document and share your wedding and life experience with your friends and family in a simple and elegant way through Say Yes! Say Yes is a theme designed to bring to life all your special occasions and moments with stunning beauty. 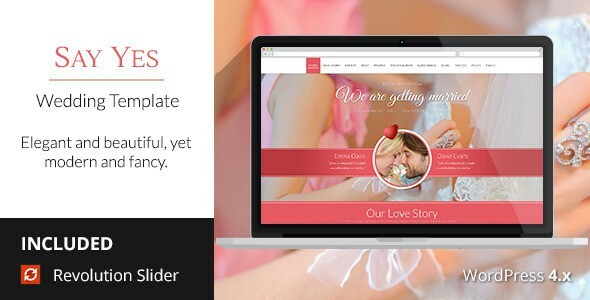 Its fashionable look and proper execution, accompanying with Revolution Slider plugin, will help you to own an awesome wedding site for lifetime. No boundaries are put to your fantasy through support for Gallery, Video, Audio, Facebook & Twitter post types and beyond, and you can continue to transform your website the way your life and love grows and flourish. Item Reviewed: Modern and Fancy Responsive WordPress Wedding Theme 9 out of 10 based on 10 ratings. 9 user reviews.